I was very pleased with the visit. All questions were answered. I am definitely coming back. Dr. Levon Kouyoumdjian believes in providing gentle and compassionate care. With years of experience and training, Dr. Kouyoumdjian treats patients with a variety of dental conditions. He is a dentist currently practicing at Jefferson Dental Clinics in Houston, TX. 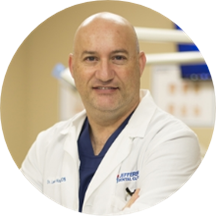 Dr. Kouyoumdjian earned his dental degree from the University of Southern California. He is fluent in multiple languages such as English, Hebrew, Arabic, French, and Armenian. He can also converse in Turkish and Spanish. He is an active member of the Academy of General Dentistry, the Alpha Omega International Dental Fraternity, and the American Dental Association. He has received several honors from the Academy of General Dentistry and the American Association of Endodontists. In his spare time, Dr. Kououmydjian enjoys spending time with his family, playing outdoor sports, travel, and watching football and tennis. Dr. Kouyoumdjian recognizes that many patients may not be completely comfortable with visiting a dentist. Hence, he endeavors to make dental visits a low-stress experience with minimal discomfort. He helps patients understand their condition and choose an appropriate treatment plan. He assists patients in receiving the dental care they require.